We are dog people and have owned a series of four chocolate Labrador retrievers since we married. Of all of the pups, Argus was the biggest and rowdiest. He was the largest of the puppies in his litter and grew to be 100 pounds of muscle topped off by an enormous head. 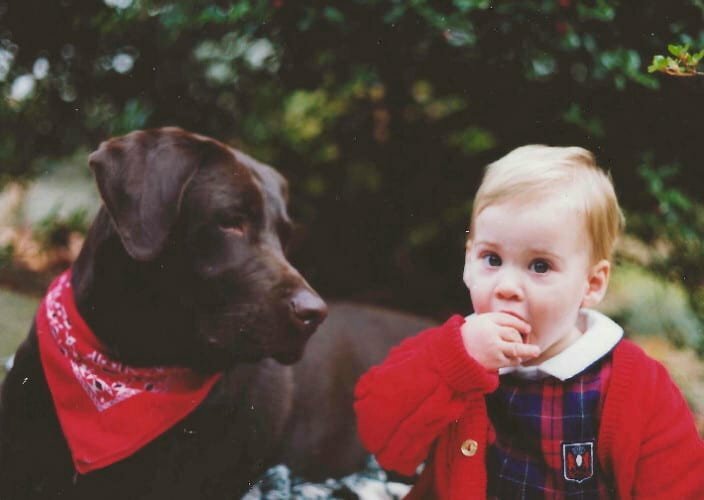 Though we named him after Odysseus’ fabled warrior dog, he was truly a gentle giant and the perfect companion for our, at the time, six-year old son. Best buddies from the day we brought him home as a puppy, they grew up together with Argus acting as playmate and confidante, alarm clock and friend. The years of puppyhood, with chewed possessions and indoor “accidents,” are distressing. But witnessing your grown child saying goodbye to a beloved, yet now-aged dog as he leaves home for college is infinitely harder. 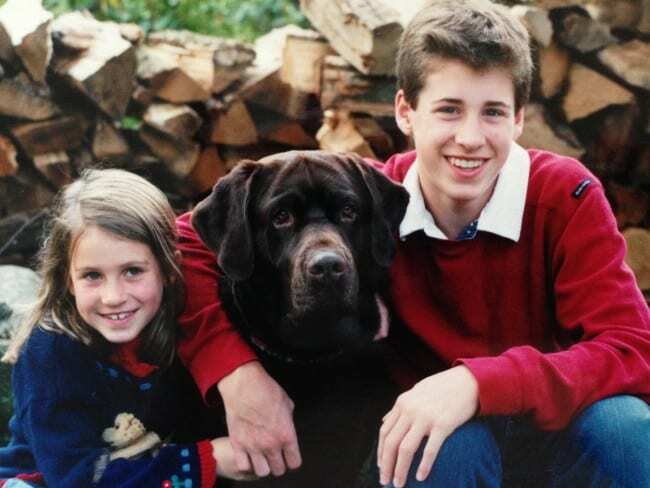 Getting a dog to accompany a child from youth to young adulthood is a true American tradition. And since the estimated life expectancy of a dog is 12.8 years, part of that tradition is often the inevitable and painful phone call parents must make to their college child telling him that the end has come for his pup. The dog of your boyhood teaches you a great deal about friendship, and love, and death: Old Skip was my brother…. They had buried him under our elm tree, they said-yet this was not totally true. For he really lay buried in my heart. As we packed our son off to college for his freshman year, my husband, daughter and I watched as he hugged Argus and told him he would see him soon. 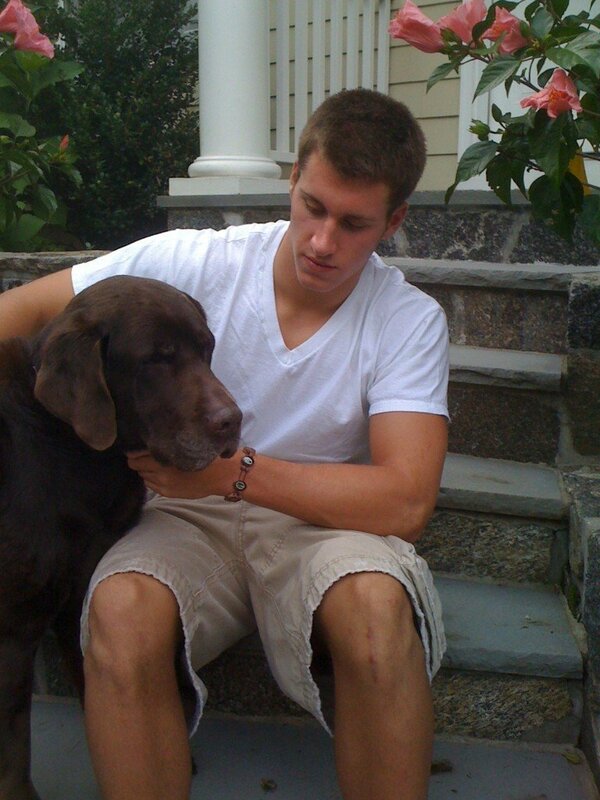 At age 13, the enormous chocolate Lab who joined our household so many years before, had accomplished his mission in seeing his boy off to college. He, too, had taught our son about friendship and love. Like Skip, he passed away during our son’s freshman year. No doubt our son will own other dogs but may never have a relationship quite like the one he had with Argus. When I think of him as a really young boy, in my mind’s eye, he is smiling broadly, running with his giant retriever. It is an indelible image.